The Annunciation is one of the High Christian Mysteries, called a “mystery” because it cannot be intellectualized but only experienced. It happens spontaneously, but only as a result of soul-development, whether through deep assimilation of life’s experiences or through specific training designed to prepare students to pass within and see the God Self inside them. Since it is called an “initiation,” it is the beginning of the process, not the fruition. Students experience a fundamental shift in consciousness and then begin to amalgamate that new sense of being into their everyday life and meditations. 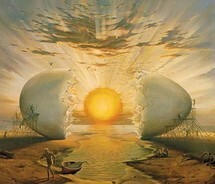 They feel as though they have been born into a new world and must relearn how to live. 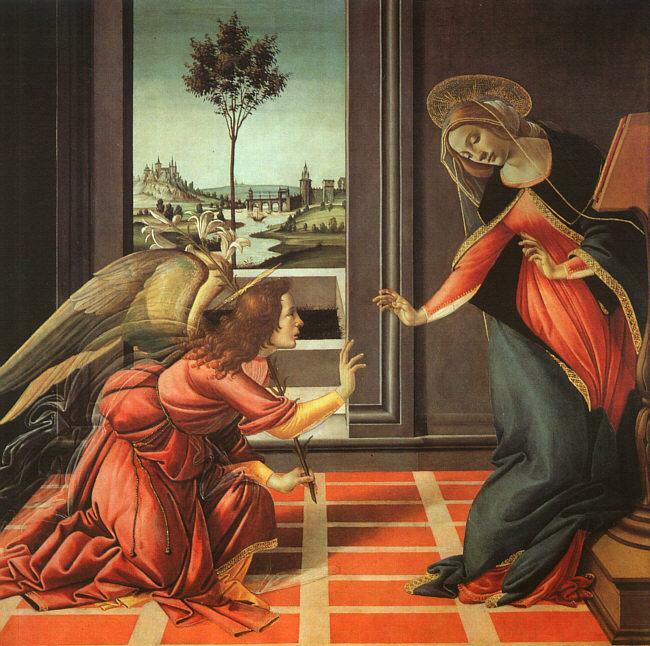 The story of the Annunciation, as it is told in the New Testament, is brief. The angel Gabriel appears to Mary and tells her that a spiritual event is about to take place. She is to give birth to the Messiah, she will name him Jesus, and God (not man) will be his father. In the story, the message is drawn out in conversational form, but in all likelihood it came whole-cloth, all the particulars combined in one instant knowing. As in all myths, the lines between spiritual and physical are intentionally blurred, not to confuse but to render the experience universal. Historical events happen at a specific time in a specific place, but mythological events happen across the entire spectrum of human life and locale. The 17th Century German mystic and poet, Angelus Silesius, said, “Of what use, O Gabriel, thy message to Marie, if though canst not also say the same thing to me?” The Biblical account of Mary’s revelation is a roadmap for mystics everywhere to prepare them for the initiation of Self-realization. In Christian Mystical symbolism, the soul is feminine. Mary is the purified soul; Magdalene is the soul’s journey of purification, away from the corruption of the senses. In a sense, both Marys are the same “person.” Even though Mary the mother of Jesus predates Mary Magdalene in the narrative, she is the regenerated Mary Magdalene who through contrition and devotion gives birth to the Christ within her being. In myth, time is slippery; events and characters are individual principles that apply to all of us and are meant to be arranged in their spiritual order, not necessarily chronologically. The elements are laid out in a tableau without perspective so that they can be absorbed through the mind, not by it. O my humble soul, womb of the cosmos, hear the Word of God. Open now, and give birth to the Sun! A wonderful and accurate description of the realization process and initiation in general. However, one might infer from this description of the Magdala’s symbolic role that she actually was the sensual prostitute she has been mistaken for by much of Christianity. Perhaps you could devote some equal time to the reality of the Gnostic Mary Magdelene in another post at some future date. Very appropriate for today, this being Mother’s Day. I imagine that some Christian Mystic women have had this experience, too–the feeling of being pregnant, even havng ‘labor pains’.